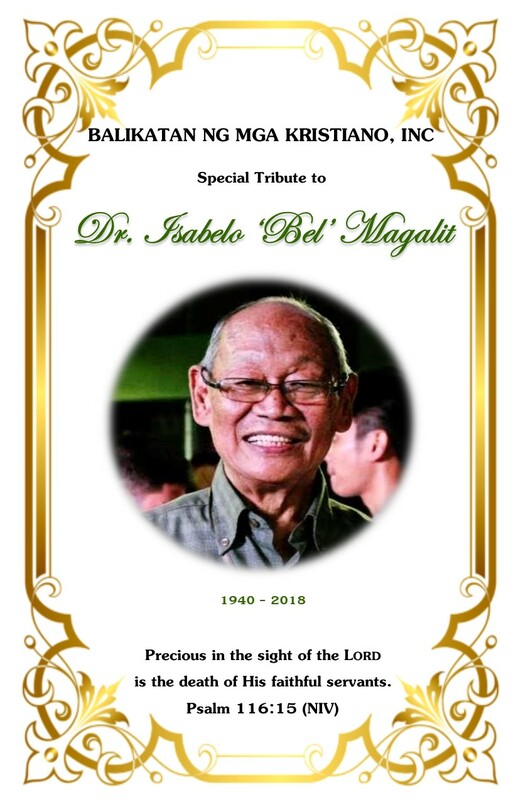 Balikatan’s Tribute to Isabelo “Bel” Magalit (1940 - 2018) - Balikatan Ng Mga Kristiano, Inc. Precious in the sight of the Lord is the death of his faithful servants. Dr. Isabelo “Bel” Magalit graduated from the University of the Philippines’ College of Medicine in 1964. 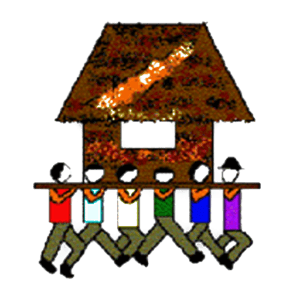 Bel was married to the former Leticia “Lety” Abakan with whom he had four children: Leni (deceased), Immanuel, Israel, and Luci and they have three grandsons. From 1966 to 1973, he was General Secretary of Intervarsity Christian Fellowship of the Philippines (IVCFP), and from 1973-1983, he was Associate General Secretary in East Asia for the International Fellowship of Evangelical Students (IFES). From 1981 to 1988, he was pastor of Diliman Bible Church (DBC) and he served from 1989 to 2005 as the first Filipino and Asian president of Asian Theological Seminary (ATS) (Reyes, 2018). In Bel, “a brilliant mind” was acknowledged by the ATS leadership. Bel was chosen as ATS president even without a seminary degree (Belo, 2018). Said Bel: “Practice the balance between scholarship and devotion for ‘we cannot maintain the evangelical tradition for any length of time without careful work in theology’ [quoting Oliver Barclay]” (Magalit, 2014). He was senior pastor of Diliman Campus Bible Church (DCBC) from 2005 to December 2016. He was also the author of these OMF Literature books and many more: How to Share Jesus, First Steps in Discipleship, Choose for Yourself This Day, Is Gay OK?, Restoring the Fallen, and Family Planning: Theological, Medical, and Legal Perspectives (Reyes, 2018). 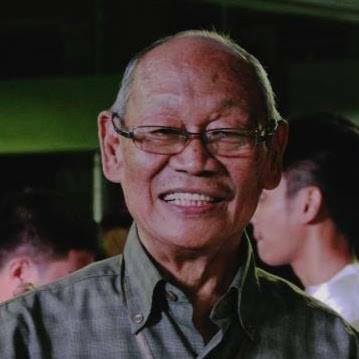 In this article, we received tributes from people who were profoundly influenced by Manong Bel’s life and ministry. These are his former college friend and co-Kawayan Camp (KC) camper, Perla Belo; former IVCFP staff, Miriam Adeney, Lisa Espineli-Chinn, Nanie Perez-Concepcion and Leni Sison-Juarez; former DBC members, Bebot Morden-Marcos, Belle Morden-Lucasan, Allan Lucasan, Valerie & Dan Malabonga and Annabelle and Landy Ancheta; and former DCBC elder and OMF Literature CEO, Ramon Rocha. We thank them for sharing their tributes and looking through old albums to find photos of them with Manong Bel.